Warwick Gardens is the perfect place for children – it has a safe playground, a dog free zone, and the log seating nestling amongst the long grass makes playtime for small kids seem like a day out in a meadow. A chance for mums to let them run around. Though sometimes I wish they would exercise constraint over their little ones when they run roughshod over the flowers and scattering the grasshoppers! On the other side of the park hanging tightly onto a leaf high up in the silver birch tree, and keeping her young nymphs close to her, is the ultimate mummy – the Parent bug. Of the ten species of shield bug living in the park the Parent bug has to be one of my favourites. 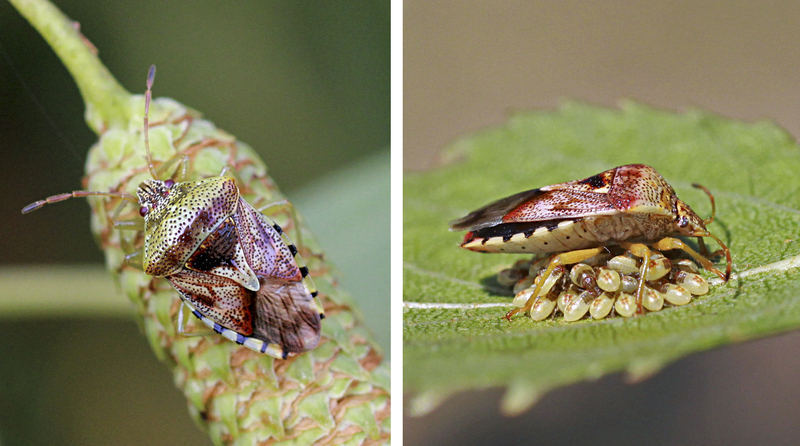 Looking very similar to the Birch shield bug, and sharing the same habitat, the Parent bug can be easily identified on the basis she sits on her eggs. This is very unusual in the bug world. They are reasonably easy to find… it just takes a keen eye and a thorough search through the leaves of the Silver birch tree. These trees have long flowing branches and in high winds wave around quite fiercely. Our bug lays her eggs in a tight cluster on the underside of a birch leaf and hangs on, bearing the brunt of the English weather. She then broods her clutch, sitting protectively over the eggs until they hatch. Like all good mums the female Parent bug looks after her family until the young finally become adults. As with all bugs, shield bugs undergo an ‘incomplete metamorphosis’ which means they do not possess larval and pupal stages. 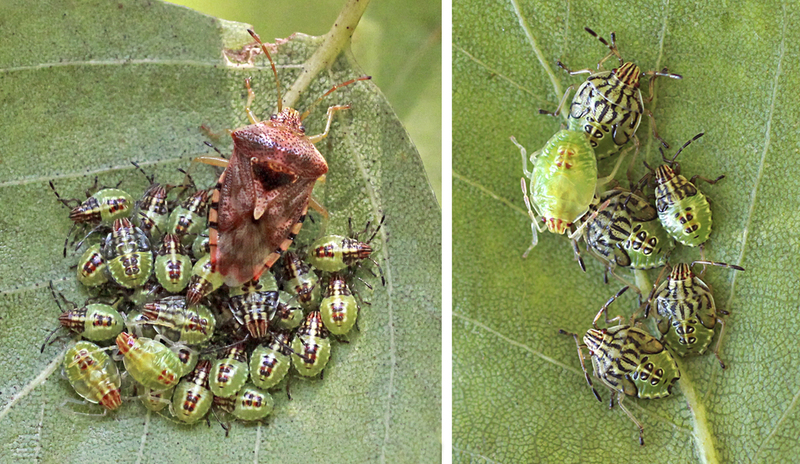 The adults develop from several stages (instars) of nymphs (up to five) through successive moultings. Nymphs resemble the adults except for size and the absence of wings and they usually have different colouration or patterns. They feed on the sap of leaves. 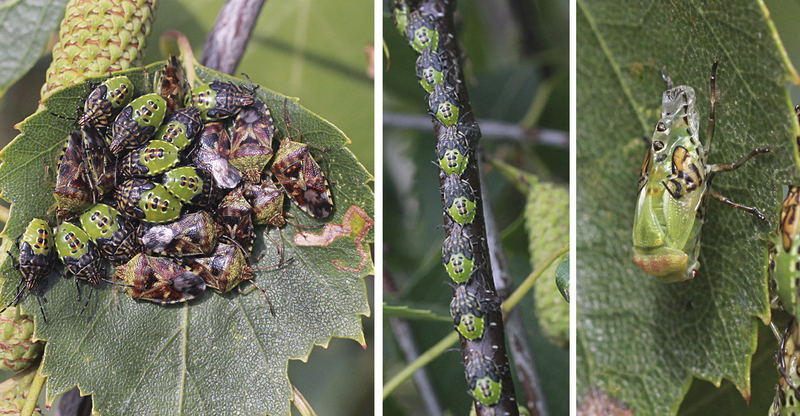 One month on and I have been watching 6 families of Parent bugs. They are living on separate parts of a silver birch tree branch. I have been fascinated with how they live: bunched together as nymphs as if scared to go out into the wide world, though a few have ventured off and spend their day alone on a leaf. One family insists on walking up a branch to visit a catkin, and later in the day I find them back on the leaf they started from. I have witnessed the moult into adulthood, the lone parent standing by the final nymph, adults waiting for their kin to moult, even a whole family finally becoming adults but still insisting staying together … but today I went to look and all my families had dispersed. I wish them love and luck – it has been a joy. This entry was posted in Insectinside, Peckham, Penny Metal, Urban wildlife, Warwick Gardens and tagged Insectinside, Parent bug, Peckham, Shield bug, Silver birch tree, Warwick Gardens by insectinside. Bookmark the permalink.